I cannot help but feel a certain sympathy for the French royal family. After Louis XIV created the absolute monarchy and centralised all the power at Versailles the pressures of state resting on the shoulders of one man, the king, must have been enormous. Louis XIV seemed to have had boundless ambition and energy, which his successors did not. The stultifying court etiquette, the intrigues of the nobility, and the pressures of almost constant war and financial crises must have made the temptation to escape a necessity rather than a flight of fancy. 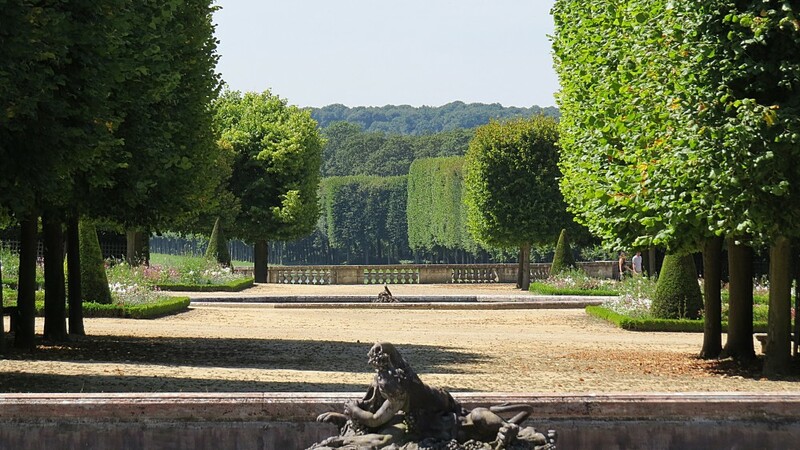 Louis XIV’s escape was to the Trianon estate that he bought some seven years after starting work on Versailles. His first house, the Porcelain Trianon was covered in blue and white faience tiles that split and flaked in the harsh winters and in 1687 it was demolished and replaced by the Grand Trianon a sugary single-storey confection of pink marble. 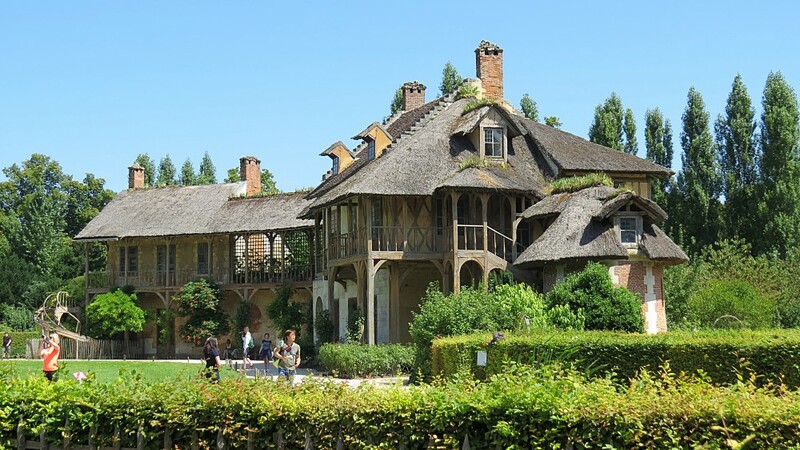 Compared to Versailles this is a surprisingly small intimate country house where the king could unwind. Louis’s passion was his gardens. 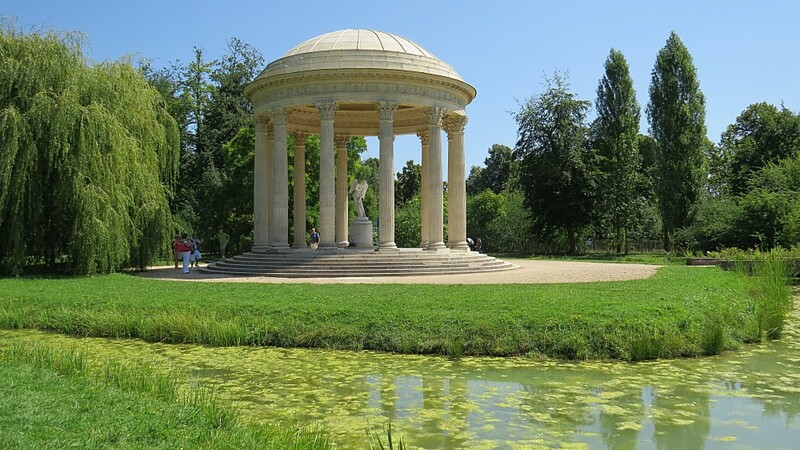 He had produced six versions of his guide to the gardens of Versailles, but it was at the Grand Trianon that his enthusiasm reached its apogee. 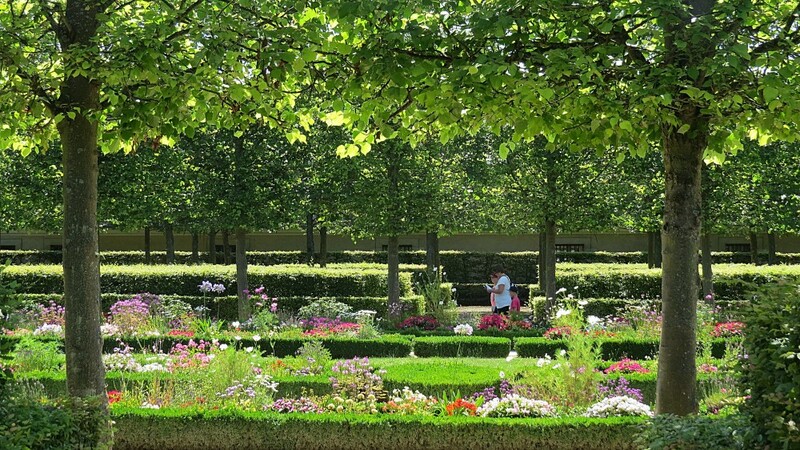 Unlike the mostly grass parterres of the Palace of Versailles, the parterres at the Grand Trianon were laid out with vast quantities of flowering plants in sunken pots that could be replaced immediately they started to fade. In addition to 40,000 Dutch tulips and 27,000 Ottoman narcissi, exotic plants were introduced into the garden to surprise and delight visitors, and proclaim that the king was able to bend nature to his will. This was a hugely expensive way to garden, and today at the Grand Trianon we have to make do with conventional seasonal bedding. Few visitors bother to venture into the garden and although I did I found little there to hold my interest. Remarkably, some areas of the neighbouring much smaller garden at the Petit Trianon still follow that grand tradition where plants are set in pots in box-lined beds and are lifted and replaced as in Louis XIV’s time. Unlike Louis XIV, his great grandson Louis XV who succeeded him and who built the Petit Trianon was indolent and his ineffectual rule led to a decline in the crown’s authority, Louis’s escape from the pressures of absolute rule was to spend time with a succession of mistresses, many of which exercised considerable political power. It was for one of these, Mme.de Pompadour that he built the Petit Trianon (although she died before it was completed). 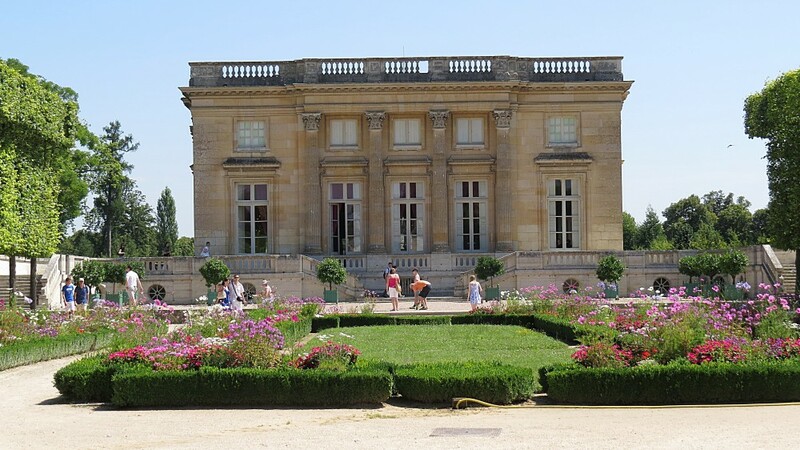 The Petit Trianon is a perfectly proportioned modest neo-classical house, built of mellow creamy-yellow stone with beautiful gardens and trellis-covered summer house After everything else I had seen at Versailles, this seemed refreshingly normal. Upon the death of Louis XV, his successor Louis XVI gifted the Petit Trianon to his wife Marie-Antoinette whose indulgent interest lay elsewhere in creating a fashionable jardin anglais, and following a visit to the Prince Conde’s ‘Normandy’ hamlet at Chantilly to create one of her own. 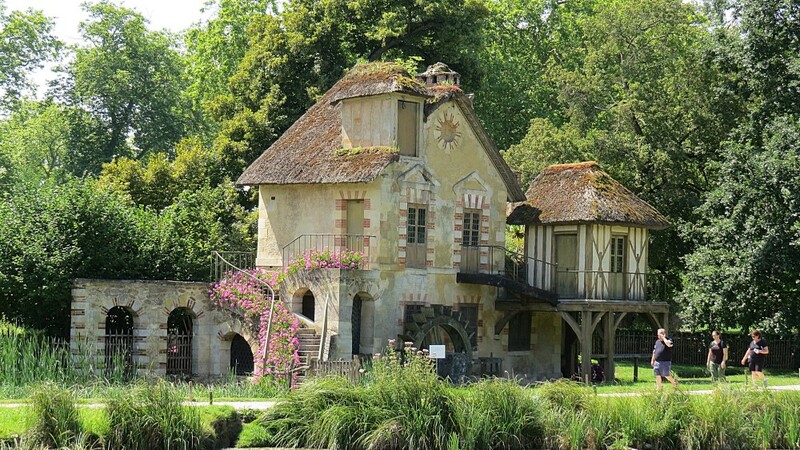 The hamlet at Trianon (Le Hameau) perfectly illustrates that her escape from the Court was into a world of fantasy. 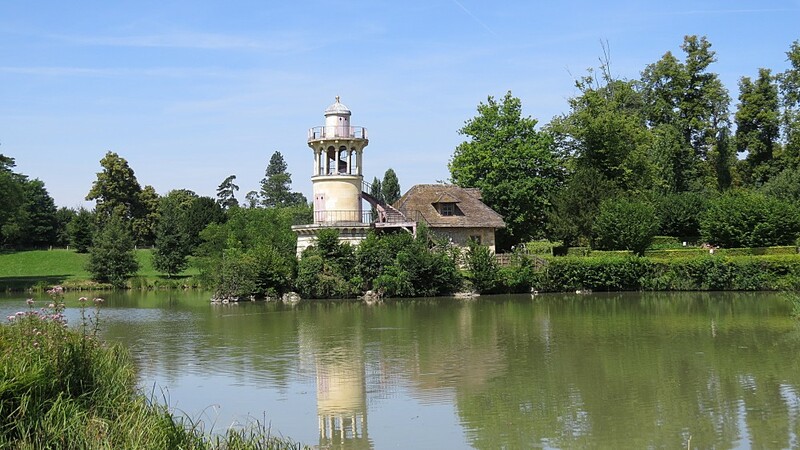 Started only six years before the French Revolution, twelve houses were built around an artificial lake, of which ten remain today. 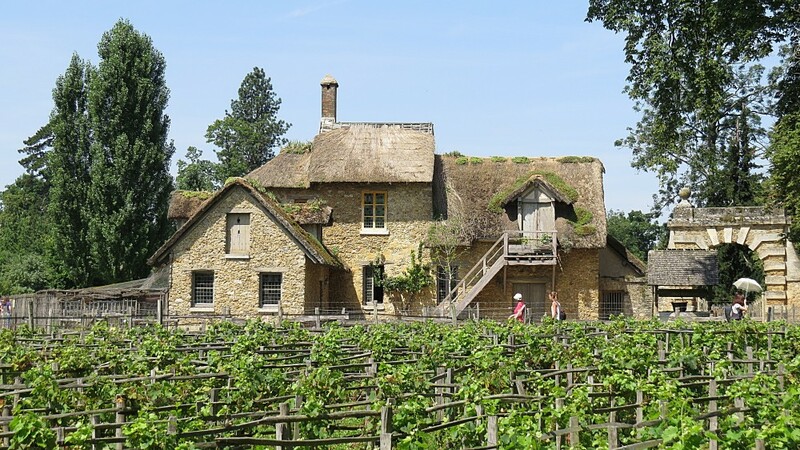 Each house had a small garden for growing flowers and vegetables, and a specific purpose – a dairy, watch-tower, mill or dovecote, and the steps and balconies were festooned with pots of flowers. The farm, to one side of the hamlet had outhouses and animals and here famously Marie-Antoinette could play at being a milkmaid. I think this intensely picturesque and vacuous re-creation would be something Disney would have been proud of. Completed only three years before the Revolution, whilst France teetered on the edge of bankruptcy following support for the colonists in the American War of Independence, and whilst the populace was starving following a succession of bad harvests, it is little wonder that ‘Madame Deficit’ as she became known was such a despised figure. Versailles seems like a dream world divorced from reality and nothing more so than the Trianon Estate. 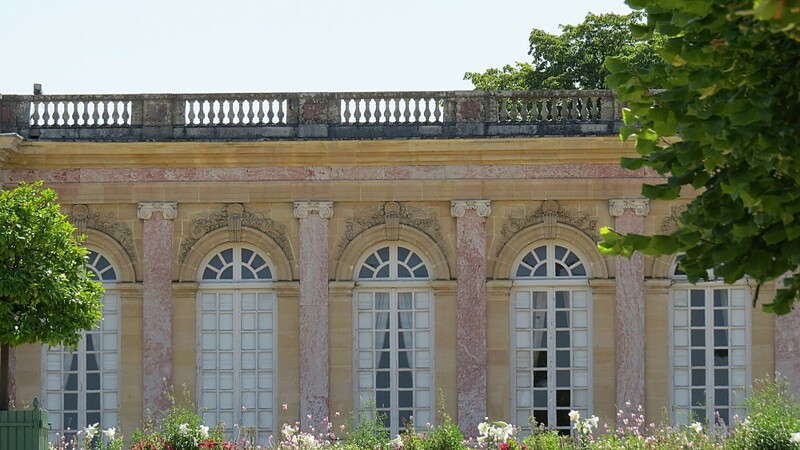 Curiously it is only Louis XV’s mistress’s house the Petit Trianon that seems to be grounded in reality. I find it fascinating to see and understand how three very different personalities escaped the pressures of absolute monarchy, and how this adds yet another dimension to the complexity of Versailles.